« Is Sony the most innovative camera manufacturer today? In the "Sleep" state, camera start-up time will be 0.7sec. Digital zoom of 3x will be available for Fuji X100 during video to get from 35mm to 105mm. 180 degree motion panorama available on Fuji X100, 7680x1440 horizontal or 7680x2160 vertical shooting. Fuji X100 can shoot macro approx. 10cm when macro mode enabled. Fuji X100 has 49 point metering area selection. When the shutter dial is set to "T" on Fuji X100, shutter stays open for a set time from 1.2s - 30s. Press once open press again close shut. With the OVF, you will be able to see a little of the scene outside the shooting frame. A "Commander" mode is available on the Fuji X100. You can disable the beeps if you want like all Fuji cameras. Shutter lag numbers for the Fuji X100 have not been provided yet from Tokyo but it is very minimal. Fuji X100 uses 4 leaf shutter not like DSLR. This allows for high speed flash sync, quiet, and durable. Fuji X100 aperture info: uses 9 blade aperture diaphragm giving excellent "Bokeh"
Fuji X100 focus and shutter sounds very much like a Fuji F300EXR. 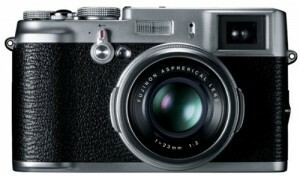 Fuji X100 will be released same time as all our '11 models, in March '11. Nothing will be decided for colors until X100 is available in the market. We have heard interest of black and may consider. Tested shots up to 3200 ISO, looks very clean however can't post as the camera is still in early pre-production. No current plans for teleconverter for Fuji X100 however with the adapter ring, I am sure a 3party converter lens would work. Fuji X100 looks like a fighter pilot heads up display. Press halfway down, you get exposure EVF preview. AF is fast, including shutter lag but model is not final yet so cannot provide numbers. Fuji x100 does not have a loud shutter sound as the Panasonic GF2. In fact, it is very quiet. Fuji X100, manual focus, there will be focus distance for both OVF and EVF with option for manual focus check (zoom in centre). Fuji X100 can set, color/sharpness/highlight tone/shadow tone/noise reduction. Fuji X100 base iso will be iso200. Low setting can be set for 100 iso and up to 12800. Fuji X100 manual focus is fly-by-wire. Focus ring can be adjusted to rotate clock-wise or counter clockwise. Fuji X100 does not need I.S., everything becomes perfectly still when it shoots. Fuji X100 manual focusing is mechanical. Fuji X100 will use NP-95 Li-ion battery. "Made in Japan" will remain etched on the back of the camera. Fuji X100 will retain last setting selected when turned off and on again. HD output on Fuji X100 will be 1280x720 at 24fps. Aperture Priority AE can be used whilst shooting movies. "FN" button on #Fuji X100 will default to quick ISO selection. "FN" button can be reassigned to other options however. I strongly suggest you follow the The Fuji Guys on twitter If you are interested in the Fuji X100 camera - they post related updates on a daily basis. I will post another update in few weeks.